You do not know me. I am a Nigerian living in the diaspora. I know you unlike my friend who continues to speak funéh after we have left the office. Even Nigerians in Antarctica have heard of you, so great is your renown like Britain’s legendary Mr. Bean. As you yab Nigerians living abroad temper your jokes with mercy because after six months in oyinbo land, we forget that we went to Burukutu Primary School and Agbaridion Secondary School—the winter makes us talk through our noses and freezes brain function. Since 2012 when I started reading your jokes on BBM and Facebook and Twitter, I have become more convinced that no condition is permanent. The way that you have metamorphosed and become as entrenched in our national consciousness as surely as Nollywood is synonymous to Nigeria is “amazing”. As you increase, may all those elements that want to take us down as a nation decrease! Talking about BlackBerry, every day, I receive several Akpos jokes on BBM. The coloured text informs me that it is a yet another viral broadcast message. I know that a response beyond LOL is oversabi; however, I cannot restrain myself. I punch my screen to reply and let the sender know that I was the one who sent him the joke first; after all, I am not a goat regurgitating cud! In spite of this, I want to thank you for the great work you are doing in Nigeria. These days, it seems as if you are the only one working hard to make us forget our problems. Can you imagine that Nigeria was ranked 20th saddest country in the world on the 2013 Legatum Prosperity Index? Dem dey craze? Even if oil reserves finish, we go laugh. Make dem flare gas troway, we go still laugh. Akpos, don’t mind them jare. If they had met you, we would not have had such a low ranking. I still do not know who you are Akpos. Everywhere I turn, I see another Akpos, so tey I have headache that only Paracetamol from India can cure. On Facebook, I found: Original Akpos, Akpos The Comedian, Akpos, Akpos (The Comedian), and Akpos Jokes. Space will not allow me list the number of Akposes I found on Twitter and the spin-offs from your vast business empire: Akpos apps for BlackBerry, Akpos android apps on Google Play, Akpos jokes from the Ovi store, and so on. This proliferation of your brand reminds me of when my mother started Pure Water business. Before we could finish tying all the cellophane bags of our Pure Water, three of our neighbours had sunk their own boreholes and started calling out on the street, “Buy Pure Water, original Pure Water!” Akpos, your enemies shall never succeed! We are counting the days till you go hammer and your Hummer go land. I will stop here before your eye begin close like newborn pickin. By now you for don release another five hundred jokes. So what do you think? Does Akpos symbolise something deeper about our national psyche—perhaps a variant of the freedom songs sung by oppressed people through the centuries? 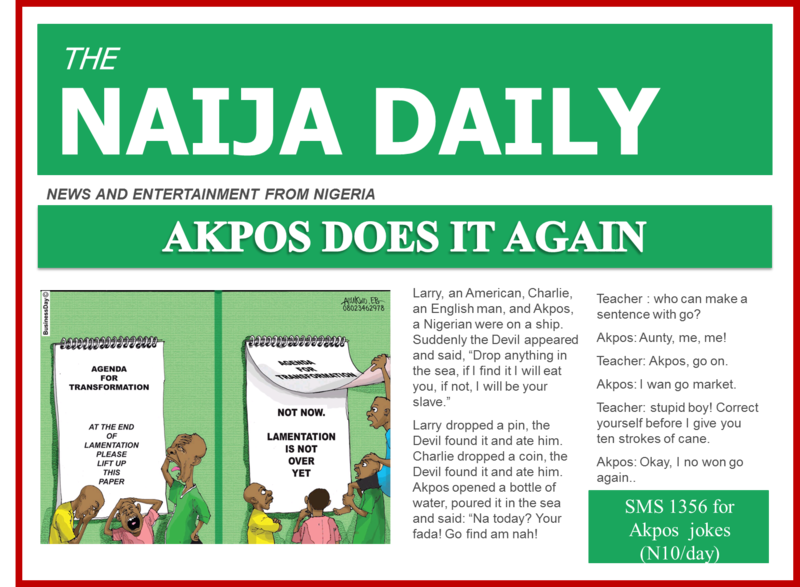 Or is Akpos a platform to show that Naija’s got talent, comic relief, pure and simple? Suffering & smiling! Sad but I adore the resilience of our people to be outwardly unperturbed by circumstances and I thank the very many ‘Akposes’ out there for spreading just a little love through laughter.
. . . to make us wise . . . food for thought. Yes life can be hard and we seek distractions and laughter may prolong survival. Only let us not laugh as we are being led to the grave, right? Glad you do Collins. Thanks for dropping by. Cogent observations here on Akpos and sadly, the Nigerian mentality. Akpos may have been created to amuse us, but he stares most of our problems in our face and we are still unwilling to lift a finger. Issues that should be taken on with all sense of purpose are laughed off and thus, life continues, even the brand is now counterfeited, that says a lot about our state of mind–Lack of drive to take initiative or creativity. True Charles, very true. We should laugh… laughter is good medicine; but we should also act.